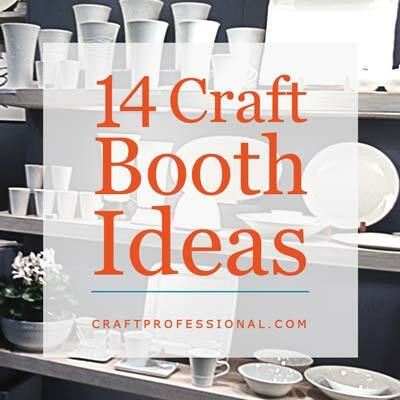 ten craft booth display tips To help you design a booth that is functional, practical and safe. The most beautiful craft booth display in the world will do you no good if it's sitting in your driveway because it won't fit in your vehicle, or blowing across the park because your craft tent wasn't weighed down properly. When you design your displays, consider these 10 tips for creating a safe and practical booth. 1. Is Your Booth Easy to Set Up and Take Down? Consider the time it will take to set up and break down your craft displays and your canopy. A simple booth setup will allow you to get your display together quickly at the beginning of a show so you can focus on your customers. You won't want to be fussing with a million little details in your booth as customers are arriving. 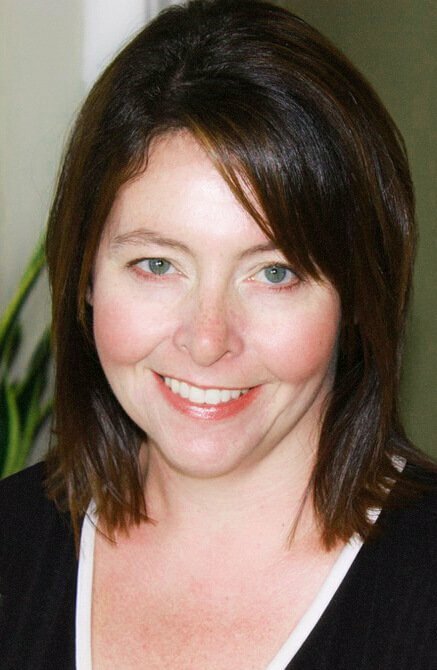 A simple setup will allow you to focus your energy where it should be, on your customers. At the end of a show you'll appreciate a display that is quick and easy to break down. After a long day at a show, the last thing you'll want to deal with is taking apart a complex display. You'll be happy when you can easily disassemble your booth and relax. 2. Is Your Craft Booth Lightweight? When you're transporting your booth you'll be happy if you were careful to use lightweight materials in your display. The easier it is to transport your display, the easier it will be for you to set up on your own if you need to do some shows without an assistant. 3. Is Your Display Wind Resistant? It's surprising how easily a small amount of wind can cause havoc with your booth. When the tarp walls are up on many craft tents, it just takes a little bit of wind to catch the tarp like a sail and carry your craft tent across the road (yes, unfortunately I'm speaking from experience here!). It's actually pretty simple to weigh down your craft tent, so there's no reason to fail to take this important safety precaution. In fact, shows generally require you to weigh down your tent in some fashion. Some craft artists simply fill large jugs with water and hang them from the top corners of their tent. This is a simple solution, but it can take away from the look of your display if you don't hide the jugs (although pretty curtains will hide them and can provide added interest to your booth). Other vendors make their own tent weights using PVC pipe filled with concrete as weights. If you want to hang these weights, you can insert a hook before the concrete dries. You can also use velcro to secure the weights to the legs of your canopy. The simplest solution for weighting your tent is to buy ready-made tent weights designed for use with craft tents. The more you connect things together, the more windproof your booth will be. Consider using velcro to connect tables to your walls or your canopy, and connect shelves to tables. The more securely display items a connected, the less you will have to worry when a gust (or two) of wind passes by. 4. Is Your Booth Cost Effective? Of course cost is usually a factor when designing a craft booth display. Do keep in mind that the most inexpensive booth is not always the most cost effective booth. For example, if you buy the cheapest craft canopy you can find, it falls apart after one or two shows, and you have to go out and buy another canopy, then suddenly your cheap canopy becomes a lot more expensive. Or if you settle for unprofessional looking displays that don't show your products in their best light, and you end up making fewer sales than you could have with better displays, your cheap displays are suddenly not so much of a bargain. 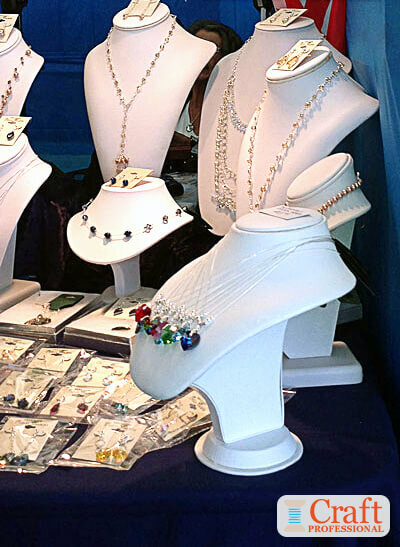 Find a good balance between affordable, high quality, durable and attractive when you are buying your craft show display supplies in order to ensure your booth is as cost effective as possible. 5. Is Your Craft Booth Portable? Do all of your craft show supplies fit in your vehicle? Using an extra long table as part of your display may seem like a great idea, until you realize it doesn't fit in your vehicle. Consider the dimensions of your vehicle when you are choosing the dimensions of your craft booth display items, and when you are buying your craft tent, ensure the tent will fit in your vehicle when it is completed folded down. 6. Is Your Craft Booth Display Easy to Store? In between shows, you are going to have to store your craft booth display somewhere, and if you don't have a lot of extra space in your home, you'll need to be smart about storage. 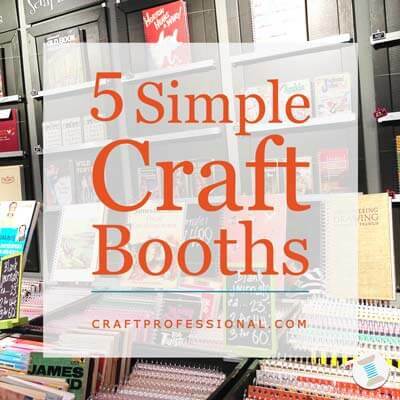 Think through the ways your craft booth will fold down for convenient storage. If you can design your booth so that the components double as storage for your inventory, that can create added convenience for you. For example, risers that double as sturdy boxes for storing inventory are wonderful; they allow you to pack up all of your inventory at the end of your show, so it's ready to go for your next sales opportunity. 7. Is Your Booth Modular? Typically you will have a ten by ten foot space at a craft show. However, the space provided can vary from show to show, and if your space is irregular in any way, you may not be able to set up your booth exactly as planned. A modular booth design, using several smaller tables instead of one or two larger tables, for example, will give you the freedom to change your booth design to best suit your space. 8. Is Your Booth Comfortable? If you do several craft shows, you are going to spend a lot of time in your booth. If you aren't comfortable in your booth, you'll struggle to focus and make a great impression on customers. 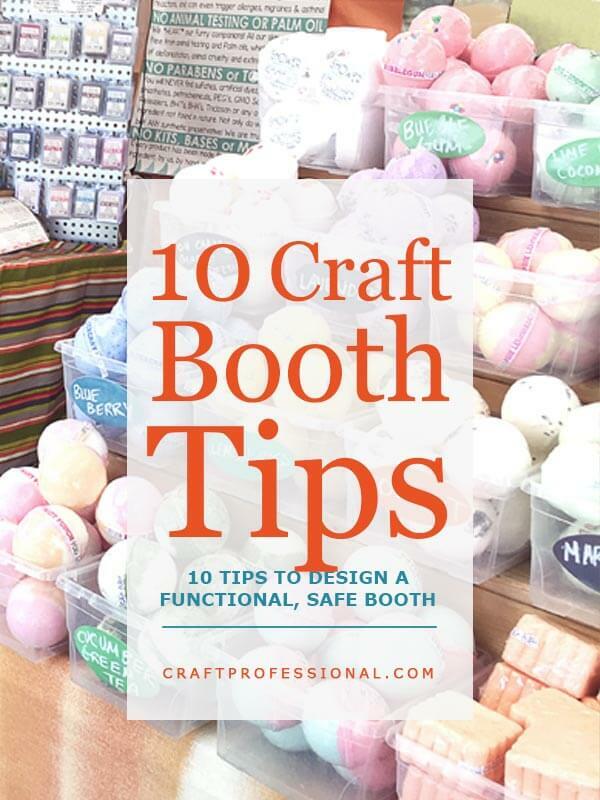 Ensure that the craft booth you design is a comfortable place where you are happy to spend your time. 9. Is Your Booth Stable? Walls and tables must be as stable as possible. Ensure the walls are secure and won't fall over and displays are not easily breakable in weather or by customers. 10. Is Your Booth Fire Safe? Ensure that any fabric you use in your display is flame retardant. Bring proof that your booth fabric and tent canopy are made from flame proofed material (craft tents usually come with this documentation when you buy them) because show organizers may ask for proof. Also, do ensure that any light fixtures and cords you use are designed to be put together and taken apart frequently and used outdoors if you are doing outdoor shows and cords are secured and don't create a trip hazard. 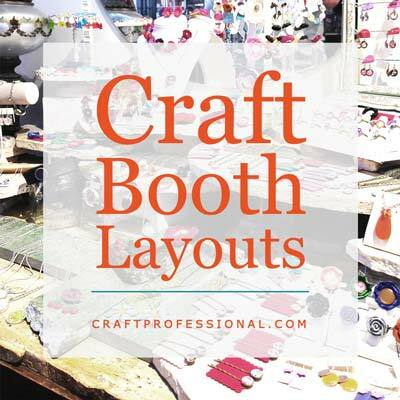 4 popular craft booth layouts. Which one is right for you?